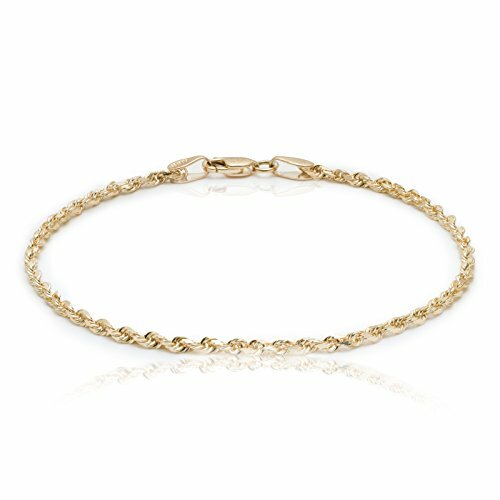 Our Fine Gold Thin Diamond Cut Rope Chain Bracelet and Anklet is the perfect simplistic, modern jewelry piece, designed for everyone. Whether you would like to use it as a bracelet or anklet, Whether you would like to use it as a bracelet or anklet, you can style this piece in endless ways, by its own, or stacked with other bracelets. Because of its durable and high-quality materials and designs, it will remain in perfect condition after years as well. This piece is made from top quality 10k fine yellow gold with a diamond cut rope finish and is available in 4 different sizes to fit everyone's individual taste. Gold is not only a very luxurious touch to our piece, it also makes this bracelet and anklet a diverse jewelry, that can be worn for any occasion. While the 7-8 inch range is perfect for women as bracelets, we offer three different anklet sizes: 9 inch is for a tight anklet, 10 inch is a regular fit, and if you are looking for a loose, bit oversized fit, we created a 11 inch option as well. This bracelet and anklet has a comfortable lobster claw clasp, so you can easily put it on, take it off and wear it throughout the day. We ensure our chain is extremely sturdy and solid, so you can wear it everyday for years and will still remain in amazing condition. This bracelet was designed to be very subtle, thin and feminine with a thickness of 2.25 mm, so it is the perfect birthday or anniversary gift for your loved ones.